Almost as soon as I started teaching writing online, I also started looking for additional tools to help writers unblock. One day while I was waiting to get my eyebrows waxed, I noticed that the office across the hall from the esthetician was a hypnotherapist. I thought, "That's what I need to learn!" Within about two weeks, I'd enrolled in a course. Pretty soon, I was a Certified Clinical and Medical Hypnotherapist. Lucky for me, hypnotherapy turned out to be a great way to move people (including me) forward in their writing. But it turns out that hypnotherapy is useful for all kind of other things, besides creative blocks, including weight loss, stress reduction, confidence building, and, well, you name it. The list goes on and on. If you have a goal with an obstacle between you and it, chances are hypnosis will help you find a way over, under, around, or through that obstacle. Hypnotherapy has become my main interest lately. Now I even have my own office, where I see clients on Sundays. I also treat them over the phone and through downloads and CDs. I've got a new web site devoted entirely to my hypnotherapy, complete with testimonials. Check it out here: rewritingmylife.com. Who would've thought? 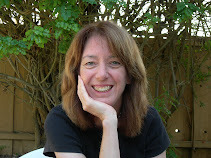 I wrote fiction and non-fiction for over twenty years. Now I have a hypnosis and coaching practice in San Diego, CA. I help people create their most wonderful lives by shifting their thoughts. It's a lot like rewriting your own story.